1. 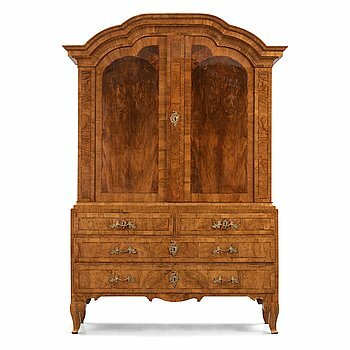 A Swedish Rococo 18th century cupboard. 2. 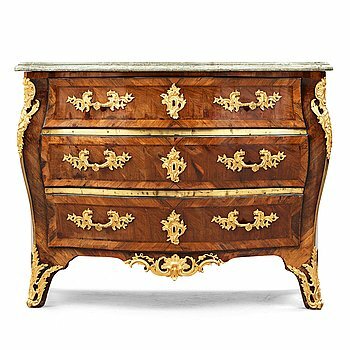 A Swedish Rococo commode by Christian Linning (master in Stockholm 1744-1779). 3. 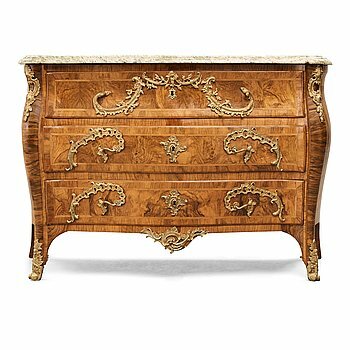 A Swedish Rococo commode by L. Nordin. 4. 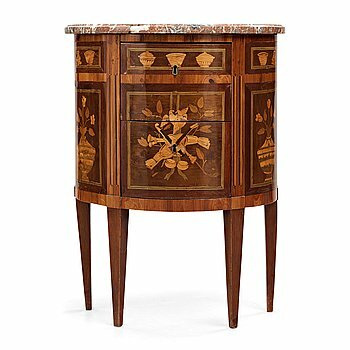 A Swedish Rococo commode by Johan Neijber, master in Stockholm 1768-1795. 5. 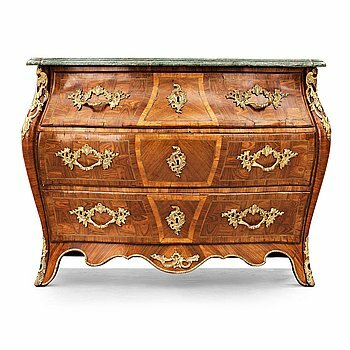 A Swedish Rococo 18th century commode. 6. 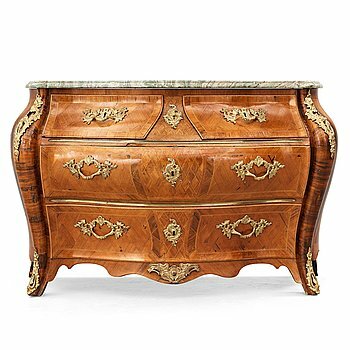 A Swedish Rococo commode attributed to Lars Bolin, master in Stockholm 1759-1801. 7. 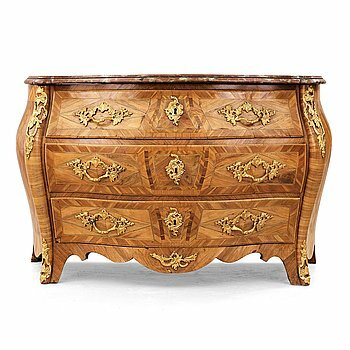 A Swedish Rococo 18th century commode by Lars Nordin, master 1743, not signed. 9. 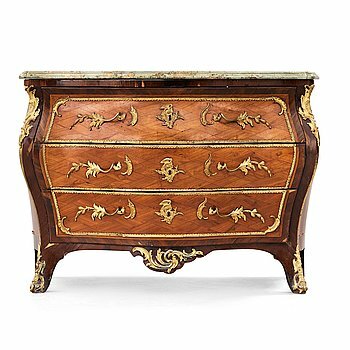 A Louis XVI Demi-lune commode by Fidelys Schey (master in Paris 1777-1788). 10. A cabine on stand by Ferdinando Pogliani (1832-1899), Milan, last quarter 19th century. 11. A Gustavian secretaire by Georg Haupt (master in Stockholm 1770-1784), not signed. 12. A Gustavian 18th century commode attributed to J. Hultsten. 13. A Gustavian commode by N. P. Stenström, not signed. 14. A Gustavian commode by Georg Haupt (master in Sockholm 1770-1784). 15. A late Gustavian late 18th century commode. 16. A late Gustavian commode. 17. A late Gustavian commode by A. Lundelius. 18. A Late Gustavian secretaire by J Åkerlund 1785. 19. A Swedish Rococo 18th century table. 20. A Swedish Rococo 18th century writing table. 21. A Gustavian 18th century faience tea table. 22. A Swedish 18th century, presumably Marieberg, faience tray. 23. A Gustavian late 18th century occasional/games table by Gottlieb Iwersson (master in Stockholm 1778-1813), not signed. 24. A Gustavian late 18th century console table. 25. A Gustavian late 18th century console table. 26. A late Gustavian circa 1800 console table. 27. A Swedish Empire early 19th Century console table. 28. An English 19th century dinner table. 29. A late Gustavian late 18th century column. 30. A French Empire bed. 31. A Gustavian sofa, late 18th centrury, by E Holm. 32. A Gustavian sofa by presumably J Lindgren. 33. A pair of Louis XV 18th century armchairs. 34. A pair of Swedish Rococo 18th century armchairs. 35. A pair of Swedish Rococo 18th century armchairs. 36. A pair of rococo arm chairs, later part of the 18th century. 37. A pair of Gustavian armchairs. 38. Six Gustavian late 18th century armchairs by Johan Lindgren, master in Stockholm 1770-1800. 39. A set of four Gustavian late 18th century armchairs. 40. A pair of late Gustavian early 19th century armchairs. 41. A late Gustavian circa 1800 armchair by A Hellman. 42. A set of eight Swedish Rococo 18th century chairs. 43. Six Gustavian late 18th century chairs. 44. Six Gustavian late 18th century chairs by Erik Öhrmark, master in Stockholm 1777-1813. 45. A set of six Gustavian chairs by J Lindgren. 46. A pair of Gustavian chairs by J Hammarström. 47. A pair of late Gustavian stools by Ephraim Ståhl, master in Stockholm 1794-1820. 48. A pair of late Gustavian stools attributed to E. Ståhl. 49. A pair of late Gustavian early 19th century stools. 51. A Swedish Rococo longcase clock by Petter Ernst (clockmaker in Stockholm 1753-1784). 52. A Swedish Rococo 18th century mirror by Nils Henrik Hamberg (active in Stockholm 1767-1776). 53. A Swedish Rococo 18th century mirror. 54. A Gustavian mirror by J. Åkerblad. 55. A gustavian mirror by Carl Gustaf Fyrwald (verksam 1776-1816). Stockholm hall mark, 1780s. 56. A Gustavian 18th century mirror by J Åkerblad, master 1758. 57. A Gustavian mirror by C. G. Fyrwald. 59. A late Gustavian late 18th century mirror by P Ljung. 60. A pair of Swedish 18th century two-light girandole mirros. 61. A matched pair of one-light girandole mirrors by Nils Meunier 1775. 62. A pair of Gustavian two-light girandole mirrors by Lago Lundén active in Stockholm 1773, dead 1819). 63. A Gustavian two-light girandole mirror. 64. A Swedish Empire wall clock by G Undén. 65. A Louis XVI barometer. 66. A Rococo 18th century eight-light chandelier. 67. A late Gustavian circa 1800 five-light chandelier. 68. A Swedish Empire 19th century six-light hanging-lamp. 69. A French late Empire mid 19th century twelve-light hanging-lamp. 70. A Louis XVI-style six-light chandelier, late 19th century. 71. A pair of Louis XVI 18th century gilt and patinated bronze and marble three-light candelabra. 72. A pair of Empire nine-light candelabra in the manner of Pierre-Phillipe Thomire. 73. A pair of Empire early 19th century five-light candelabra by Pierre Chibout. 74. An Empire 19th century three-light candelabra. 75. A pair of late Gustavian late 18th century three-light table girandoles. 76. A pair of Louis XVI candlesticks. 77. A pair of Louis XVI late 18th century candlesticks/cassolettes. 78. A presumably Russian Empire early 19th century table lamp. 79. A French late Empire 19th century table lamp. 80. A Empire Lampe à bouillotte. 81. An Empire LAMPE À BOUILOTTE. 82. A pair of French Empire early 19th century three-light candelabra. 83. A pair of French Empire early 19th century four-light candelabra. 84. A pair of Empire early 19th century gilt bronze four-light candelabra. 85. A pair of late Gustavian circa 1800 porphyry and bronze candlesticks. 86. A pair of late Gustavian candlesticks, circa 1800. 87. A pair of late Gustavian candlesticks. 88. A pair of French Empire early 19th century candlesticks. 89. A pair of Swedish Rococo pewter candlesticks by E P Krietz, made in Stockholm 1772. 90. A set of four Swedish late Gustavian pewter candlesticks by E P Krietz, made in Stockholm. 91. 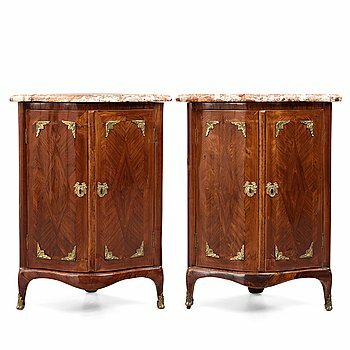 A pair of French Empire early 19th century urns. 92. A Empire around 1800 perfume burner. 93. A gilded bronze and glass bowl by Eugène Cornu in Paris, second half of the 19th century. 94. An empire style urn, presumably Baccarat, France, second half of the 19th century. 95. A Risler & Carré dinner plateau, Paris, circa 1900, Louis XVI-style. 96. An English 18th century table clock, dial signed George Clarke, Leaden Hall, Street London. 97. An English early 18th century table clock, dial signed David Wyche London. 98. A French Louis XV bracket clock, first half 18th century, marked "Julien Le Roy A PARIS". 99. A Louis XVI late 18th century mantel clock. 100. A Louis XVI circa 1790 mantel clock.